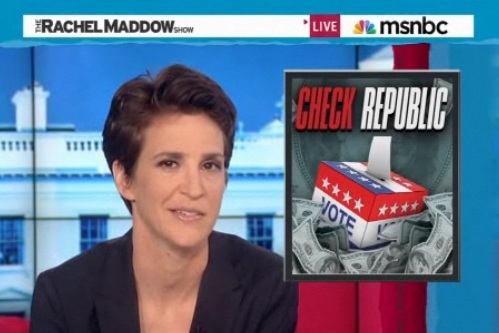 On Wednesday night’s The Rachel Maddow Show, host Rachel Maddow devoted a segment to California’s proposed hike on that state’s cigarette tax, but used the measure as a parable for the corrupting influence of big money in politics which has become a central theme in this election. While the segment proves the point ably, the very starkness of that influence demonstrates something else that you don’t hear political commentators talk about very often. As Rachel points out, California has the second-lowest rate of smoking in the country, along with one of the lowest cigarette taxes in the country. When the cigarette tax hike was proposed (the proceeds of which would all go to fund cancer research), it was very popular with Californians, and as recently as March, was polling at 67%. Since then, though, tobacco companies have waged a $47 million campaign against the tax, and when the state voted on Prop 29 on Tuesday, the result was a too-close-to-call tossup that had Big Tobacco holding a slight lead. Rachel is absolutely right that this demonstrates the corrupting influence of big money in politics, and if anyone wonders if Scott Walker‘s 8-to-1 fundraising advantage in the Wisconsin recall election made a difference, this story makes a compelling argument that it did. Regardless of what else this tells you, there is a desperate need for publicly-funded elections in this country. But there’s a harder truth embedded in this story. Yes, there are ways in which voters are disadvantaged by huge money being spent on misleading ads, and the news media often falls down on the job of sorting it all out, but when the choices are this stark, and this much attention is being paid, it’s hard not to feel like these people are getting the government they deserve. We can make laws to try and protect our democracy from the corrupting influence of big money (and we should), but no law will protect us from the fact that every election is decided by the 10 stupidest people in any given crowd of a hundred. Even when they get it right (no matter which side you’re on), the people they elect then have to spend all of their time trying to figure out how to fool them into doing it again. That’s America. Now, there will be those who think I judge the politically disengaged middle too harshly, that they’re busy people with busy lives, but if you don’t, at this moment, know the difference between Mitt Romney and Barack Obama, there’s really no excuse. We can’t make them pay attention, but at least we can try to even out the levels of noise that gets shouted at them.